The horned guan (Oreophasis derbianus) is a large, approximately 85 cm long, turkey-like bird with glossed black upperparts plumage, red legs, white iris, yellow bill and a red horn on top of head. 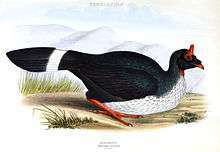 The breast and upper belly are white, and its long tail feathers are black with white band near base. Both sexes are similar. The young is duller with smaller horn, and has brown tail and wings. The only member in monotypic genus Oreophasis, the horned guan is distributed in humid mountain forests of southeast Mexico-(Chiapas) and Guatemala of Central America. It is found in altitude up to 3,350 metres. Its diet consists mainly of fruits, green leaves and invertebrates. 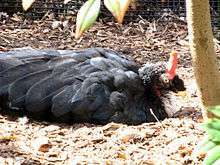 The female usually lays up to two eggs. The horned guan is not a true guan, but merely resembles these birds most in overall shape and color, whereas the horn is more reminiscent of the helmeted curassows. In fact, this species is the only survivor of a very ancient lineage of cracids that has been evolving independently from all other living members of this family for at least 20, possibly as much as 40 million years. 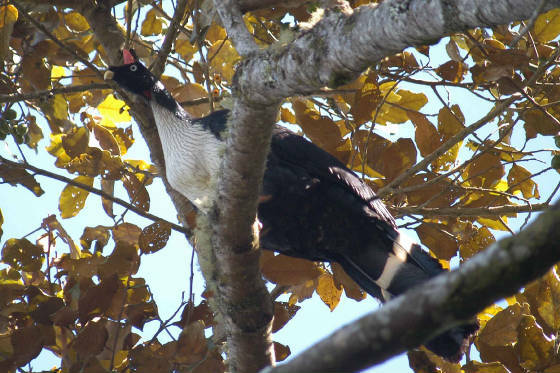 Due to ongoing habitat loss, small population size, limited range and hunting in some areas, the horned guan is evaluated as Endangered on the IUCN Red List of Threatened Species. It is listed on Appendix I of CITES. ↑ BirdLife International (2013). "Oreophasis derbianus". IUCN Red List of Threatened Species. Version 2013.2. International Union for Conservation of Nature. Retrieved 26 November 2013.